Mauretania is the Latin name for an area in the ancient Maghreb. It stretched from central present-day Algeria westwards to the Atlantic, covering northern Morocco, and southward to the Atlas Mountains. Its native inhabitants, seminomadic pastoralists of Berber ancestral stock, were known to the Romans as the Mauri and the Masaesyli. 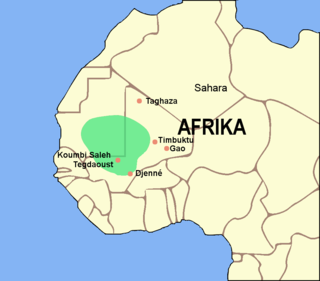 The Soninke language is a Mande language spoken by the Soninke people of Africa. The language has an estimated 1,096,795 speakers, primarily located in Mali, and also in Senegal, Ivory Coast, The Gambia, Mauritania, Guinea-Bissau, Guinea and Ghana. It enjoys the status of a national language in Mali, Senegal, The Gambia and Mauritania. The Char Bouba war, or the Mauritanian Thirty Years' War, took place between 1644-74 in the tribal areas of what is today Mauritania and Western Sahara. It was fought between the Sanhadja Berber tribes resident in the area, led by Lamtuna Imam Nasr ad-Din, and the Maqil Arab immigrant tribes, foremost of which was the Beni Hassan. The Maqil were an Arabian nomadic tribe that emigrated to the Maghreb region, with the Banu Hillal and Banu Sulaym tribes, in the 11th century. They mainly settled in and around Morocco's Saharan wolds and oases; in Tafilalet, Wad Nun, Draa and Taourirt. Despite their originally small number they later played a regionally significant role in fighting the Merinids, whereas they were forced to subjugate themselves to their authority at times when the central power of this dynasty was strong. They were also influential in altering the culture of these regions. This, today, mainly manifests in the Hassaniya language which was named after one of their sub-groups. Modern-day slavery still exists in different forms in Mauritania. According to some estimates, thousands of Mauritanians are still enslaved. A 2012 CNN report, "Slavery's Last Stronghold," by John D. Sutter, describes and documents the ongoing slave-owning cultures. This social discrimination is applied chiefly against the "black Moors" (Haratin) in the northern part of the country, where tribal elites among "white Moors" (Bidh'an, Hassaniya-speaking Arabs and Arabized Berbers) hold sway. Slavery practices exist also within the sub-Saharan African ethnic groups of the south. This ethnic discord was evident during inter-communal violence that broke out in April 1989 (the "Mauritania–Senegal Border War"), but has since subsided. Mauritania expelled some 70,000 sub-Saharan African Mauritanians in the late 1980s. Ethnic tensions and the sensitive issue of slavery – past and, in some areas, present – are still powerful themes in the country's political debate. A significant number from all groups seek a more diverse, pluralistic society. Mauritania became an independent nation in November 1960. In 1964 President Moktar Ould Daddah, originally installed by the French, formalized Mauritania as a one-party state with a new constitution, setting up an authoritarian presidential regime. Daddah's own Parti du Peuple Mauritanien (PPM) became the ruling organization in a one-party system. The President justified this on the grounds that Mauritania was not ready for western-style multi-party democracy. Under this one-party constitution, Daddah was reelected in uncontested elections in 1976 and 1978. Though cautiously watched by the international community, the coup came to be generally accepted, with the military junta organizing elections within a promised two-year timeline. In a referendum on 26 June 2006, Mauritanians overwhelmingly (97%) approved a new constitution which limited the duration of a president's stay in office. The leader of the junta, Col. Vall, promised to abide by the referendum and relinquish power peacefully. Mauritania's establishment of relations with Israel –it is one of only three Arab states to recognize Israel –was maintained by the new regime, despite widespread criticism from the opposition. They considered that position as a legacy of the Taya regime's attempts to curry favor with the West. On 6 August 2008, the head of the presidential guards took over the president's palace in Nouakchott, a day after 48 lawmakers from the ruling party resigned in protest of President Abdallahi's policies. [ which? ] The army surrounded key government facilities, including the state television building, after the president fired senior officers, one of them the head of the presidential guards. The President, Prime Minister Yahya Ould Ahmed Waghef, and Mohamed Ould R'zeizim, Minister of Internal Affairs, were arrested. The government bureaucracy is composed of traditional ministries, special agencies, and parastatal companies. The Ministry of Interior spearheads a system of regional governors and prefects modeled on the French system of local administration. Under this system, Mauritania is divided into 15 regions ( wilaya or régions). Mauritania is in the western region of the continent of Africa, is generally flat, its 1,030,700 square kilometres forming vast, arid plains broken by occasional ridges and clifflike outcroppings. 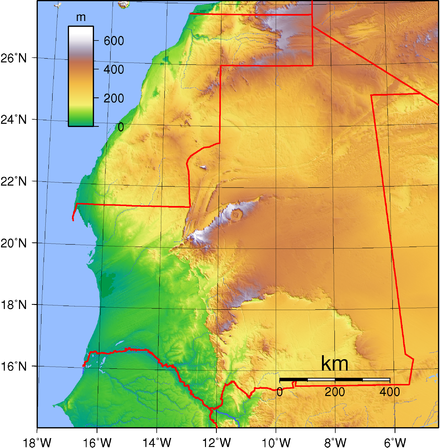 It borders the North Atlantic Ocean, between Senegal and Western Sahara, Mali and Algeria. It is considered part of both the Sahel and the Maghreb. A series of scarps face southwest, longitudinally bisecting these plains in the center of the country. The scarps also separate a series of sandstone plateaus, the highest of which is the Adrar Plateau, reaching an elevation of 500 metres. Spring-fed oases lie at the foot of some of the scarps. Isolated peaks, often rich in minerals, rise above the plateaus; the smaller peaks are called guelbs and the larger ones kedias. The concentric Guelb er Richat is a prominent feature of the north-central region. Kediet ej Jill, near the city of Zouîrât, has an elevation of 1,000 metres and is the highest peak. Approximately three-quarters of Mauritania is desert or semidesert. As a result of extended, severe drought, the desert has been expanding since the mid-1960s. The plateaus gradually descend toward the northeast to the barren El Djouf, or "Empty Quarter," a vast region of large sand dunes that merges into the Sahara Desert. To the west, between the ocean and the plateaus, are alternating areas of clayey plains (regs) and sand dunes (ergs), some of which shift from place to place, gradually moved by high winds. The dunes generally increase in size and mobility toward the north. Despite being rich in natural resources, Mauritania has a low GDP. A majority of the population still depends on agriculture and livestock for a livelihood, even though most of the nomads and many subsistence farmers were forced into the cities by recurrent droughts in the 1970s and 1980s. Mauritania has extensive deposits of iron ore, which account for almost 50% of total exports. Gold and copper mining companies are opening mines in the interior. Slavery persists in Mauritania. In 1905, the French colonial administration declared an end of slavery in Mauritania, with very little success. Although nominally abolished in 1981, it was not illegal to own slaves until 2007. Ahmed Ould Daddah is a Mauritanian economist, politician and civil servant. He is a half-brother of Moktar Ould Daddah, the first President of Mauritania, and belongs to the Marabout Ouled Birri tribe. He is currently the President of the Rally of Democratic Forces (RFD) and was designated as the official leader of the opposition following the 2007 presidential election, in which he placed second. Zeine Ould Zeidane is a Mauritanian economist and politician. He placed third as a candidate in the March 2007 presidential election, and he subsequently served as Prime Minister from April 2007 to May 2008. Mohamed Lemine Ould Guig is a Mauritanian academic and political figure. He was the 8th Prime Minister of Mauritania from December 18, 1997 to November 16, 1998. Guig was never a member of any political party. Guig was the Prime Minister between stints by Cheikh El Avia Ould Mohamed Khouna. 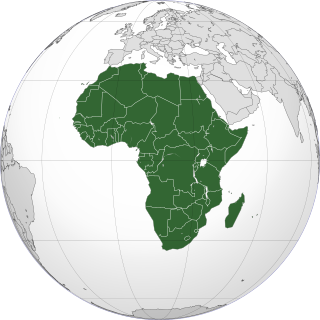 1 2 3 4 5 6 "The World Factbook – Africa – Mauritania". CIA. 1 2 3 4 "Mauritania". International Monetary Fund. ↑ "Coup Leader Wins Election Amid Outcry in Mauritania". The New York Times . 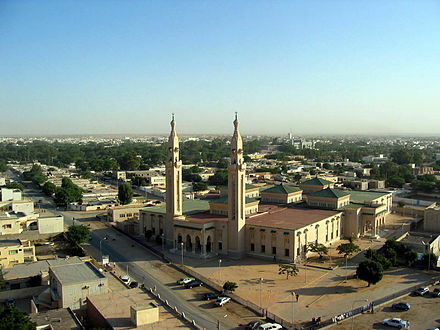 Nouakchott, Mauritania. Associated Press (AP). 19 July 2009. Retrieved 7 December 2014. ↑ Chaabani, H.; Sanchez-Mazas, A.; Sallami SF (2000). "Genetic differentiation of Yemeni people according to rhesus and Gm polymorphisms". Annales de Génétique. 43 (3–4): 155–62. doi:10.1016/S0003-3995(00)01023-6. PMID 11164198. 1 2 "Mauritania - History". Library of Congress Country Studies. ↑ "Mauritania: History". www.infoplease.com. Retrieved 2017-01-16. ↑ Pazzanita, Anthony G. (2008). 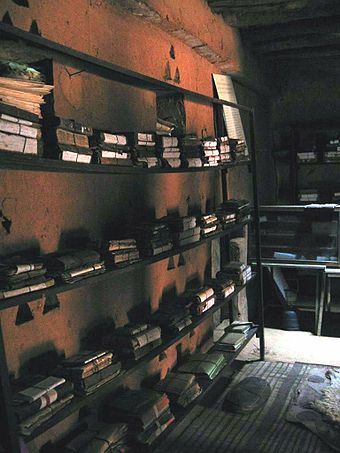 Historical Dictionary of Mauritania. Lanham, Md. : Scarecrow Press. ISBN 978-0-8108-6265-4. page 369. ↑ "Mauritanian MPs pass slavery law", BBC News. 9 August 2007. ↑ Yasser, Abdel Nasser Ould (2008). Sage, Jesse; Kasten, Liora, eds. Enslaved: True Stories of Modern Day Slavery. Macmillan. ISBN 978-1-4039-7493-8. 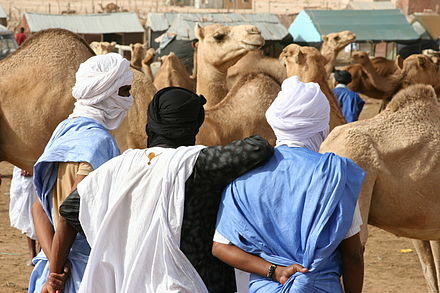 ↑ "Mauritania made slavery illegal last month". South African Institute of International Affairs. 6 September 2007. Archived from the original on 21 November 2010. ↑ "BBC World Service - The Abolition season on BBC World Service". www.bbc.co.uk. ↑ "Mauritania (Tier 3)" (PDF). Report. US Dept. of State. pp. 258–59. ↑ "Slavery's last stronghold", CNN.com (16 March 2012). Retrieved 20 March 2012. ↑ MAURITANIA: Fair elections haunted by racial imbalance, IRIN News. 5 March 2007. ↑ "Cour internationale de Justice - International Court of Justice". www.icj-cij.org. 1 2 3 "Mauritania's campaign of terror, State-Sponsored Repression of Black Africans" (PDF). Human Rights Watch/Africa (formerly Africa Watch). 1994. ↑ Baduel, Pierre Robert (1989). "Mauritanie 1945–1990 ou l'État face à la Nation". Revue du monde musulman et de la Méditerranée (in French). 54: 11–52. 1 2 Sy, Mahamadou (2000). L'Harmattan, ed. "L'enfer de Inal". Mauritanie, l'horreur des camps. Paris. ↑ "Inventory of Conflict and Environment (ICE), Template". American University. Archived from the original on 17 February 2012. Retrieved 20 March 2012. ↑ Diallo, Garba (1993). "Mauritania, a new Apartheid?" (PDF). bankie.info. Archived from the original (PDF) on 6 December 2011. ↑ Duteil, Mireille (1989). "Chronique mauritanienne". Annuaire de l'Afrique du Nord (in French). XXVIII (du CNRS ed.). ↑ Lindstrom, Channe (October–November 2002). "Report on the Situation of Refugees in Mauritania: Findings of a three week exploratory study" (PDF). American University of Cairo. p. 21. Archived from the original (PDF) on 25 July 2012. ↑ "Crackdown courts U.S. approval". CNN. 24 November 2003. Archived from the original on 7 April 2008. Retrieved 6 August 2008. ↑ "Mauritania: New wave of arrests presented as crackdown on Islamic extremists". IRIN Africa. 12 May 2005. Retrieved 6 August 2008. ↑ "Mauritania officers 'seize power'". BBC News. 4 August 2005. Retrieved 6 August 2008. ↑ "Mauritania vote 'free and fair'". BBC News. 12 March 2007. Retrieved 6 August 2008. ↑ "48 lawmakers resign from ruling party in Mauritania". Tehran Times . 6 August 2008. Archived from the original on 6 December 2008. 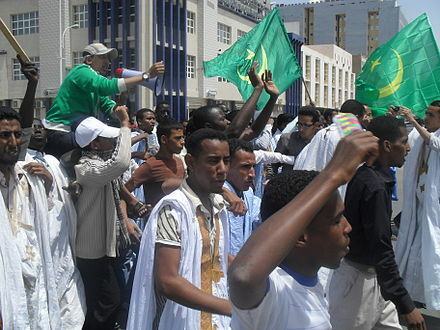 ↑ "Coup in Mauritania as president, PM arrested". Google. AFP. 6 August 2008. Archived from the original on 9 August 2008. Retrieved 4 July 2010. ↑ "Troops stage 'coup' in Mauritania". BBC News. 6 August 2008. Retrieved 4 July 2010. ↑ McElroy, Damien (6 August 2008). 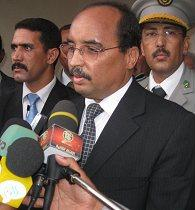 "Mauritania president under house arrest as army stages coup". The Daily Telegraph. UK. Retrieved 4 July 2010. ↑ Vinsinfo. "themedialine.org, Generals Seize Power in Mauritanian Coup". Themedialine.org. Retrieved 4 July 2010. ↑ "Mauritania Affirms Break with Israel". Voice of America News. 21 March 2010. Retrieved 4 July 2010. ↑ Adams, Richard (25 February 2011). "Libya's turmoil". The Guardian. London. ↑ Evans, Robert (9 December 2012). "Atheists around world suffer persecution, discrimination: report". Reuters. Retrieved 7 January 2015. ↑ Mehta, Hemant (17 May 2018). "Mauritania Passes Law Mandating Death Penalty for "Blasphemy"". Patheos. Retrieved 17 May 2018. ↑ "Mauritania: Encyclopædia Britannica" . Retrieved 27 February 2016. 1 2 3 4 5 "Human Development Report 2009 – Mauritania". Hdrstats.undp.org. Archived from the original on 8 July 2010. Retrieved 4 July 2010. ↑ "Mauritania struggles with love of fat women". MSNBC. 16 April 2007. Retrieved 5 September 2012. ↑ "Education system in Mauritania". Bibl.u-szeged.hu. Retrieved 4 July 2010. ↑ "English is All the Rage in Mauritania - Al-Fanar Media". Al-Fanar Media. 2015-08-29. Retrieved 2018-06-10. 1 2 Thomas Schlüter (2008). Geological Atlas of Africa: With Notes on Stratigraphy, Tectonics, Economic Geology, Geohazards, Geosites and Geoscientific Education of Each Country. Springer Science & Business Media. p. 166. ISBN 978-3-540-76373-4. ↑ R. H. Hughes (1992). A Directory of African Wetlands. IUCN. p. 401. ISBN 978-2-88032-949-5. ↑ Njoki N. Wane (2009). A Glance at Africa. AuthorHouse. pp. 58–. ISBN 978-1-4389-7489-7. 1 2 International Monetary Fund. Middle East and Central Asia Dept. (2015). Islamic Republic of Mauritania: Selected Issues Paper. International Monetary Fund. pp. 19–22. ISBN 978-1-4843-3657-1. ↑ Mauritania junta promises free elections. thestar.com (7 August 2008). ↑ "Taoudeni Basin Overview". Baraka Petroleum. Archived from the original on 24 February 2009. Retrieved 14 March 2009. ↑ "UAE installs eight solar energy plants in Mauritania". ↑ Mauritania. Country Reports on Human Rights Practices – 2007, US State Department, 11 March 2008. Retrieved 20 March 2012. ↑ 'Prisoner torture rising' in Mauritania, SAPA/AP, 3 December 2008. ↑ Sillah, Ebrimah. Mauritania: 'Chains Are Jewellery for Men', Inter Press Service, 3 December 2008. ↑ Mauritania: Torture at the heart of the state . Amnesty International. 3 December 2008. Index Number: AFR 38/009/2008. 1 2 2010 Human Rights Report: Mauritania. State.gov (8 April 2011). Retrieved 20 March 2012. ↑ "Mauritania must immediately release Mohamed Mkhaïtir, blogger sentenced to death for apostasy". www.amnesty.org. 5 March 2015. ↑ "The unspeakable truth about slavery in Mauritania". The Guardian . 8 June 2018. Archived from the original on 25 August 2018. ↑ John D. Sutter (March 2012). "Slavery's Last Stronghold". CNN. Retrieved 25 June 2017. ↑ "Mauritania woman gets six months in jail for slavery". bbc.co.uk. 17 January 2011. Retrieved 14 December 2013. 1 2 3 4 Slavery's last stronghold. CNN.com (16 March 2012). Retrieved 20 March 2012. ↑ "Mauritanian minister responds to accusations that slavery is rampant". CNN. 17 March 2012. I must tell you that in Mauritania, freedom is total: freedom of thought, equality – of all men and women of Mauritania... in all cases, especially with this government, this is in the past. There are probably former relationships – slavery relationships and familial relationships from old days and of the older generations, maybe, or descendants who wish to continue to be in relationships with descendants of their old masters, for familial reasons, or out of affinity, and maybe also for economic interests. But (slavery) is something that is totally finished. All people are free in Mauritania and this phenomenon no longer exists. And I believe that I can tell you that no one profits from this commerce. "Mauritania". The World Factbook . Central Intelligence Agency.